An anthology of science-fiction and fantasy short stories by indie authors brought together by the social network Goodreads. The collection, which contains 14 stories from 12 writers from around the world, includes a wide range of speculative fiction, from slices of fantasy and time travel to steampunk and science-fiction. The tales vary widely, yet are all born from the same drive to create, share ideas and above all to entertain! A short story from the world of The Light Beyond the Storm Chronicles. When a haughty princess scorns a barbarian chieftain, her city pays the price. The experiment had not been a success and now time was running out. Or was it running in? A professor of history, a mysterious scientific institute and an impossible painting in a story of time travel. A dream of desolation and death. How can this end be a beginning? And how can a dream seem so real? Mal is a necromancer. Now her greatest debt is being called in, and her skills are needed. On a murder investigation, no less. Kira’s town has so far survived the destruction wrought by the Government on so many others. But for how much longer? There are those who would stop at nothing to keep certain inventions from becoming a reality. A new war is being fought on the rooftops and alleyways by men in mech suits. Giordano discovers he’s a half-blood. His search for his real father will take him farther than he thought. Steph Bennion is a writer, musician and civil servant in Westminster, born and bred in the Black Country but now living in South London, England. Her science-fiction stories are written as a reaction to the dearth of alternative heroes amidst bookshelves swamped by tales of the supernatural. For every aspiring vampire or wizard, the world needs an astrophysicist, an engineer, or at the very least someone who can make the trains run on time. Her debut self-published space-opera adventure Hollow Moon, for young adults and adults young-at-heart, was published in 2012. The sequel Paw-Prints Of The Gods is out now! > Interview: Creative Barbwire and Indie Book Reviewer blogs. Growing up in Texas, Ubiquitous Bubba studied the lore of the Storyteller, the mysterious art of the tall tale, and the pervasive universal existence of Bubbas. They’re everywhere. As he wandered universes, he discovered that there’s always a Bubba around when you need one. Ubiquitous Bubba enjoys relaxing at home with his wife and three kids. He enjoys telling stories, eating pizza, and holding the recliner down. It hasn’t gotten away yet, but one can’t be too careful. > Interview: Creative Barbwire blog. Alexandra Butcher is a British author who lives in the South West UK. She currently has two adult dark fantasy / fantasy romance novels in the Light Beyond the Storm Chronicles series with more to follow. She also writes erotica, short fantasy stories, and poetry. She lives with three very naughty guinea pigs and an elderly rabbit, oh and not forgetting her human partner of many years. She is much too lazy to have many hobbies other than an interest in history and natural history and an occasional fascination with trying to be a photographer. Emma Faragher writes futuristic fantasy. Born in 1992 in the UK, she grew up with a love of books. She started writing night-time stories for family friends, then moved on to writing books aimed at adults as she became one herself. Currently studying at Sheffield university she is the author of the Trix SinClara series. An urban fantasy set in the future and following a shapeshifter as she is thrust into responsibility she never imagined she’d have. The House, the first book in the series, is currently published and available, with others coming soon. Emma balances writing with studying and her other hobbies. Always busy, she sometimes finds time to sit and read a book as well. Escaping into other worlds. Ross Harrison is a writer of, primarily, science fantasy. He has been writing since childhood without thought of publication. When the idea was planted by his grandmother to do so, it grew rapidly, and after a bumpy ten years or so, here sits the fruit. Ross lives on the UK/Eire border in Ireland, hoping the rain will help his hair grow back. The NEXUS science fantasy / space opera series is his main body of work, but a semi-noir thriller will be available later in 2013. Josh Karaczewski is living in the San Francisco Bay Area until he can retire somewhere warmer. His stories have been published in several literary journals: one receiving a Pushcart Prize nomination, though he hasn’t won any sort of cart for his writing yet. His books include the seriocomic novel, Alexander Murphy’s Home for Wayward Celebrities, and the short story collection, My Governor’s House and other stories; any day now the riches will pour in from these so that he can write full time. Until then, he will continue forcing high school students to read, write, and think. Peter Lean is the pen-name used by the author for his fiction works. Jurist in real life, authors of several law books in his native language (Italian), he started recently to write fiction, either for fun or as an experiment. He realized he enjoys doing that and, since science fiction short stories were his first love, he decided to try his hand in this field. He has published a number of short stories for Kindle and other e-book readers and, recently, a collection of his first short stories, Photographs. A Journey Through Space, Time, and More.The Guns Of Napoleon is his first short story, and also the skeleton on which the author based his first novel, which will be published by the end of 2013. Stan Morris was born in Linwood, California. He wrote his first novel when he was fourteen. At age twenty one he moved to New Mexico, where he met the teenager he later married. They have two sons, both gainfully employed (thank goodness!). In 1983 they moved to Maui where Stan later retired after years of assembling computers. He is the author of seven books; Surviving the Fog, Surviving the Fog – Kathy’s Recollections, Sarah’s Spaceship Adventure, The Colors of Passion and Love, Sam’s Winnings, Kate’s Movie Star, and Amy’s Hero. He is presently working on Julee Mackenzie and the First Officer, Jara Mackenzie Versus the Planet Marl, and Captain MaAckenzie and the Last Chance Spaceship. His website includes information about Maui, Japanese Manga, and his favourite music. > Interview: Creative Barbwire and Library of Erana blogs. Neil Shooter grew up in northern England and now lives in a quiet suburban corner of Ontario, Canada. Always a slow learner, it has taken Neil most of his adult life to realize that the one thing that never fails to ground him and make him happy is the thing he should be doing with the rest of his life. Better late than never… Causality, his story in this anthology, was published in January 2013 and is the first in a series of connected short stories The Causality Sequence. The next story is called Probability. Barbara G. Tarn is a writer, sometimes artist, mostly a world-creator and storyteller. She’s been building her world of Silvery Earth for a number of years – stories, comprise shorts, novels and graphic novels. Used to multiple projects (a graphic novel is always on the side of the prose), she writes, draws, ignores her day job and blogs (since October 2009) as an indie author (since January 2011, when her first title, Jessamine, came out on Smashwords). Conall and Damir’s story is in Books of the Immortals – Water and Jordan’s story continues in Books of the Immortals – Ether. Her other works are the Silvery Earth saga (adult unconventional fantasy – 19 titles and counting) and the Star Minds science-fantasy series. > Interview: Library of Erana blog. L. L. Watkin is the pen name for writing partnership Liz Smith and Louise Smith, two sisters from the North of England who’ve been writing together for nearly ten years but only started publishing in 2012. As well as writing they publish a couple of fanzines, blog a bit and enjoy spoiling their rabbit, Buzz Lightyear. They have several short stories available for free download, and two science-fiction novel series (Leviathan and The Handmaiden). Gary Weston is a retired engineer, living with his dog Minnie, in a small town in the lower North Island of New Zealand. He was born in England. He has been writing seriously for about five years and now has over 50 titles as an indie writer. He was never going to write science-fiction, which is probably why he has written about 20 of them. He also writes detective stories, adventure, and paranormal. 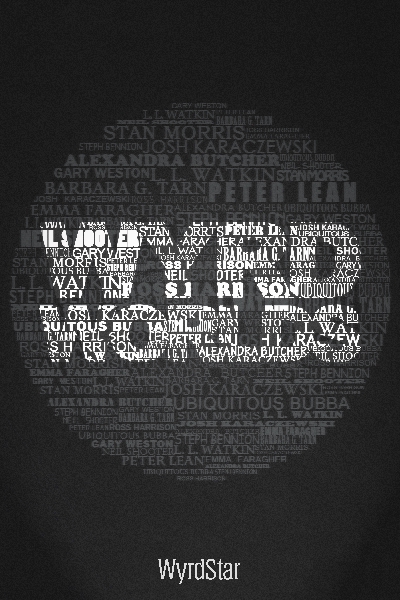 September 2013 Wyrd Worlds First edition. NOTE: If you obtained this ebook from Smashwords, you can download all subsequent updates at no extra cost. Gods and Monsters released in paperback at Amazon.